At Exhale we we are all about the health of our gut and we can’t talk about our Immune System without talking about the gut. The two are inextricalby linked. Over 70% of our immune system resides in our gut: (aka colon and/or large intestine). The gut is often the first entry point for exposure to pathogens (bad bacteria and virus’ that can cause disease); therefore your gut immune system needs to be thriving and healthy in order to avoid illness. The digestive system is a group of organs working together to convert our food into energy. Within the digestive system is the large intestine which, comprises of cells, proteins, tissues and organs which work together in a complex way to defend the body against harmful bacteria, infectious diseases and toxins, together they’re called the “gut microbiome.” A healthy adult, on average, carries 1.5-2kg of bacteria in the gut. The aim of the microbiome is to secrete lymphocyte cells which attack harmful invaders. These lymphatic cells also form bundles which work together to protect the mucous membranes of the small intestines from infection. They do this by releasing specific white blood cells known as T-cells and B-cells to defend the inside of the digestive tract from infection, as well as the damage that they cause to the intestinal walls. A variety of illnesses can occur when these protective functions of the gut are compromised. Intestinal permeability causes the immune system to go into overdrive; mounting an unnecessary response against things like gluten, bad bacteria and undigested foods which have passed through these permeable holes in the gut lining. 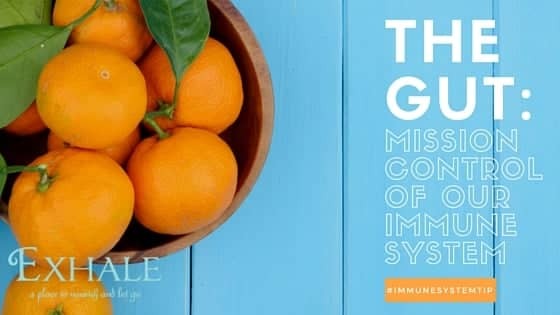 Signs that your immune system is out of balance are: food and seasonal allergies, chronic inflammation, chronic sinusitis, colds and flus that linger for weeks and constant recurring colds and flus. You may also notice a rise of food intolerances. If left unhealed, this can lead to immune abnormalities and eventually autoimmune conditions and other health issues. Some of these include inflammatory bowel disease, arthritis, eczema, psoriasis, depression, migraine headaches, muscle pain and fibromyalgia, chronic fatigue, type 1 diabetes, Graves’ disease, colitis, thyroiditis, multiple sclerosis, lupus, scleroderma, Crohn’s disease and Addison’s disease to name a few. The best way to balance our immune system is by having a healthy and strong digestive system, and this means our gut bacteria needs to be in balance. Our western ways of eating hasn’t helped to keep our gut bacteria balanced. Most traditional cultures regularly consume fermented foods like natural yogurt, sauerkraut, and kimchi, which feed the beneficial bacteria in our gut. In the West, however, we tend to do the opposite. What can DAMAGE our gut microbiome? Antibiotics – antibiotics have a devastating effect on beneficial gut bacteria in the human body, not only in the gut but in other organs and tissues. Take antibiotics only when they are necessary. Remember, antibiotics don’t help if you have a virus, such as colds or the flu. Diet – What we eat has a direct effect on the composition of our gut flora. A modern diet of convenvience rather than nutrition, full of processed foods, has a serious detrimental effect on the gut flora. Too many sugary and processed carbohydrates increase a number of different fungi, Candida in particular. Disease – Different infectious diseases like, typhoid, choloera, salmonella and some viral infections can cause lasting damage to the gut. Chronic illness such as diabetes, auto-immune disease, and endocrine disease are accompanied by serious defects in the gut flora. Stress – Short or long term physical and psychological stress can do permanent damage to the gut flora. What can HEAL our gut microbiome, our immune system and our overall health? Eat whole food; healthy meals that include lots of fruits and vegetable and unrefined foods. Aim to remove all refined sugars and processed grains which feed the “bad” bacteria. Eat naturally fermented foods daily like saurkraut, kefir, natural yoghurt and take a probiotic supplement when needed. Probiotic supplements contain high amounts of beneficial bacteria and “seed” the gut – an important part of finding balance. Allow your body to shut down, reset, and recharge. A minimum of 7 hours sleep a night is best. And get to bed before well before 12am as our most beneficial hours of sleep are between 10pm and midnight. Take a walk through nature, walk the dog, meditate, play your favourite sport or do low intensity exercise like yoga, tai chi or qi gong. Practice mindfulness techniques; here is a great article about how to: Train Your Brain to Boost Your Immune System. “A well functioning gut with healthy gut flora holds the roosts of our health. Just as a tree with sick roots is not goingng to thrive, the rest of the bodycannot thrive without a well-functioning digestive system,” Dr. Natasha Campbell-McBride, MD. 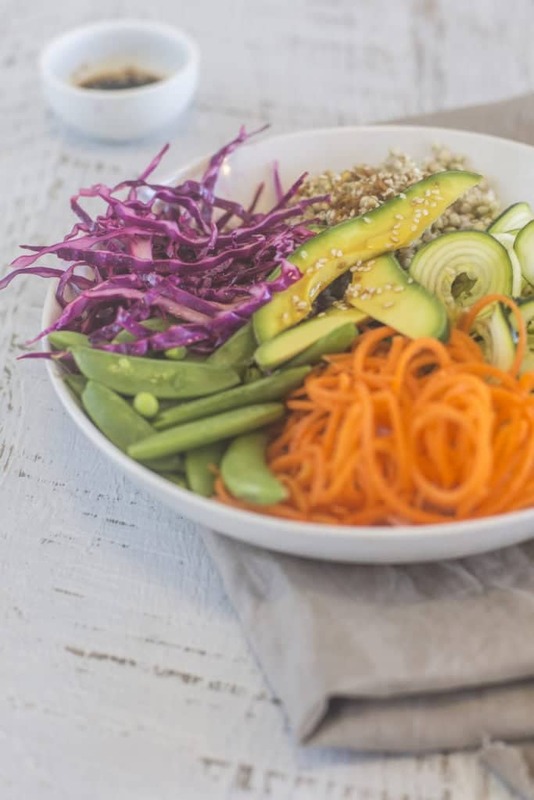 This delicious bowl is packed with flavors and nutrients that both you taste buds and gut will love! If you have soaked your buckwheat overnight, you will just need to boil 1 cup of water and add rinsed buckwheat to cool for 4-5 minutes. If you didn’t soak your buckwheat you will need 2 cups of water and to boil for 10-12 minutes. Soaking your buckwheat overnight will make it more easily digestible.